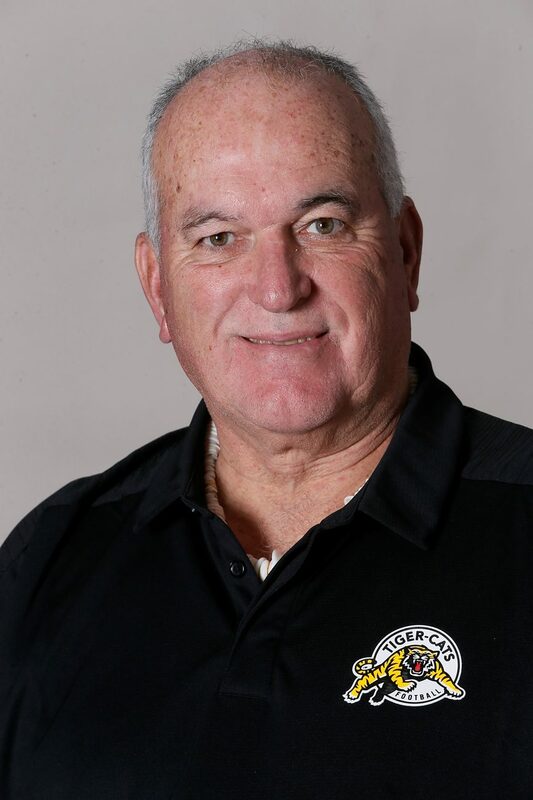 June Jones was named Associate Head Coach and Offensive Coordinator of the Hamilton Tiger-Cats December 3, 2018, relinquishing his role as Head Coach to promote his successor, Orlondo Steinauer. Jones originally joined the organization as Assistant Head Coach August 2, 2017 before being promoted to Head Coach August 24, 2017. In Jones’ only full season as Head Coach of the Tiger-Cats in 2018, the club earned second place in the CFL’s East Division and hosted the BC Lions in the Eastern Semi-Final. The Tiger-Cats defeated the Lions 48-8 to advance to the Eastern Final before falling to the Ottawa Redblacks. In the 2018 CFL regular season, Jones guided the Tiger-Cats to first in the league in net offence (405.6 yards per game), average yards per play (7.1), average gain per pass (9.1 yards), pass completions of 20+ yards (56), time of possession (31:24 per game), fewest two-and-outs (72) and fewest opponent first downs (332). Additionally, several Tiger-Cats enjoyed career and all-star seasons during Jones’ first full campaign, including nine Ticats being named CFL East Division All-Stars (quarterback Jeremiah Masoli, wide receivers Brandon Banks and Luke Tasker, offensive lineman Brandon Revenberg, defensive tackle Ted Laurent, linebackers Larry Dean and Don Unamba, and defensive backs Delvin Breaux Sr. and Cariel Brooks), five being named CFL All-Stars (Banks, Tasker, Revenberg, Unamba and Breaux Sr.) and three being named the East Division’s most outstanding players in their respective categories (Masoli – most outstanding player; Dean – defensive player; Revenberg – offensive lineman). On offence, Tasker and Banks tied for the league lead in touchdown receptions (11), Banks led the league in receiving yards per game (101.6), 30+ yards receptions (13) and second down converted receptions (41) and became the first player in club history to record 10 100+ yards receiving games in a single season, while Masoli became the first player in Tiger-Cats history to record 12 300+ yards passing games. On defence, Dean became just the fourth player in Tiger-Cats’ history to record 100+ defensive tackles in a season (105), finishing tied for third in the CFL in defensive tackles and fifth in the league in total defensive plays (113). After taking over head coaching duties in his first season with the Tiger-Cats, no team in the CFL had more wins and points in the standings than Hamilton’s six and 12, respectively, from Labour Day until the end of the 2017 season. In that same time frame, the Tiger-Cats offence posted the league’s most points for (295), net offence (4,071 yards), passing yards (3,081), rushing yards (1,149), offensive touchdowns (28), rushing touchdowns (13), first downs (226) and were second in points for per game (29.5), all while turning the ball over just a league-low 13 times. Individual accomplishments over that stretch included Masoli leading the league in passing yards (3,032), receivers Banks (959), Jalen Saunders (739) and Tasker (728) posting the second, third and fourth-most receiving yards in the CFL, and Banks also leading the league in touchdown receptions (7). There were also significant numbers posted on the defensive side of the ball for the Tiger-Cats after Jones was appointed Head Coach. From Labour Day on, The Tiger-Cats defence ranked first in rushing yards allowed per game (73.4), quarterback sacks (33), forced fumbles (13) and pass knock downs (38), and were second in interceptions (12) and net offence allowed per game (335.5 yards). Defensive end Adrian Tracy also posted a league-leading nine sacks and defensive back Richard Leonard was second in the CFL with five interceptions over that span. Jones has significant experience and a lengthy coaching resume, including head coaching stints in the NCAA at Southern Methodist University (2008-14) and the University of Hawaii (1999-2007), and in the National Football League with the San Diego Chargers (Interim – 1998) and Atlanta Falcons (1994-96). In just over six seasons at the helm of SMU football, Jones rebuilt a program that had won just two games in its’ previous two seasons and hadn’t been to a bowl game for nearly a quarter century. During his tenure, the Mustangs won three bowl championships, sent 22 players to the NFL, and his “Run and Shoot” offence essentially rewrote the SMU record book, setting 13 of the school’s 14 all-time offensive team records. Jones was also named Conference USA Coach of the Year by The Sporting News in 2009, marking the fourth time in his career he received that honour (1999, 2006, 2007). Prior to his time at SMU, the Portland, Oregon native served nine seasons as head coach at the University of Hawaii, similarly rebuilding an otherwise downtrodden Warrior football program that had just suffered its’ first-ever winless season in 1998, and had a combined 12 wins and no NFL draft picks or bowl game berths in the five years before his arrival. In 1999, Hawaii’s 9-3 record after going 0-12 in 1998 marked the biggest season-to-season improvement in NCAA history. Jones went on to lead the Warriors to 76 wins overall, the most by any Hawaii coach in school history, as well as two Western Athletic Conference Championships and six bowls. The program also developed six All-Americans and 17 NFL draft picks during that span, including putting a school-record five players into the NFL in 2007. In 1994, Jones was named head coach of the Atlanta Falcons. Despite taking over the worst team in the NFL from the previous season and having no first or second-round draft picks in his first-two years, the Falcons made the playoffs in 1995 and became the first team in NFL history to have five players go over 1,000 yards on the same team. Jeff George had 4,000 passing yards, three wide receivers went over 1,000 yards (Eric Metcalf, Bert Emanuel and Terrance Mathis), and Craig “Ironhead” Heyward rushed for over 1,000 yards as well. Jones also spent time in the NFL as the Falcons’ Offensive Coordinator (1991-93), Detroit Lions’ Quarterbacks and Wide Receivers Coach (1989-90) and Houston Oilers’ Quarterbacks Coach (1987-88). Overall, he enjoyed 13 years as a coach in the NFL, and coached Hall of Fame quarterbacks Brett Favre (1991), Warren Moon (1987-88) and Jim Kelly (1984). During his NFL stops, he also coached three other quarterbacks to their only Pro Bowl appearances: Chris Miller (1991), Bobby Hebert (1993) and Jeff George (1995). In 1986, Jones was co-offensive coordinator of the Canadian Football League’s Ottawa Rough Riders, joining the team after the United States Football League folded. He had been coaching in the USFL the previous two seasons with the Denver Gold as offensive coordinator (1985) and Houston Gamblers as wide receivers coach (1984). Jones made his coaching debut in 1983 as quarterbacks coach of the Hawaii Rainbow Warriors. Before his coaching career began, Jones also played quarterback for the Atlanta Falcons for five years (1977-81) and had a one-year stop in the CFL with the Toronto Argonauts in 1982. He signed with the Falcons as a free agent out of Portland State after earning All-America honors with the Vikings, where he led the nation in passing and total offense.